Once you have taken the necessary measures for developing and sustaining a Lean culture within the organization, it is time for the evaluation phase of Lean Six Sigma deployment. We now move towards the end of our LSS deployment series with key performance indicators (KPIs) that you can use for measuring the performance of your Lean Six Sigma strategy. 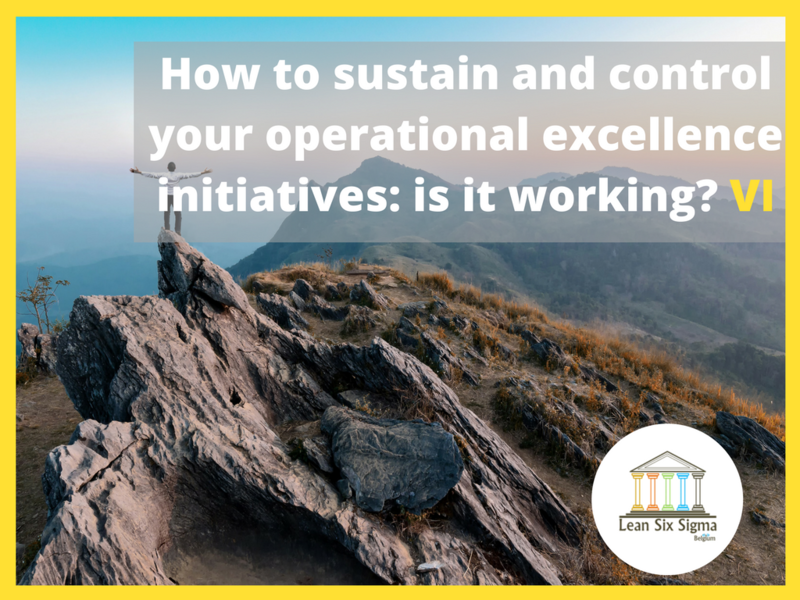 So, what are the most important KPIs that you need to measure to control operational excellence? A key performance indicator is a value that measures the effectiveness of a company in achieving its business objectives. These KPIs are essential for evaluating the success of Lean Six Sigma program within an organization. The costs to the organization for launch and deployment of its Lean Six Sigma initiative. This will include costs for diagnosis of preliminary opportunity and awareness programs (measured in the first year only), project selection workshops, selection of belts (Master Black Belts, Black Belts, and Green Belts), training of Black Belts, Green Belts, Process Owners, and Master Black Belts. The estimated launch and development costs are 145,600 € in the first year, 261,525 € in the second year, 325,050 € in the third year, 214,785 € in the fourth year, and 219,450 € in the fifth year of Lean Six Sigma deployment. Please note that all estimates given in this section of the article are for a company of 10,000 people and might be subject to change depending on the size of the organization. The recurring costs to the organization for accommodating the Lean Six Sigma personnel (Master Black Belts, Black Belts, Green Belts, and Program Manager). This includes the salary/stipend of these full-time and part-time employees, payments for each project (payable to the teams on completion of project – including Green Belts), and cost of coaching and certification. The estimated personnel costs are 1,480,000 € in the first year, 4,032,125 € in the second year, 7,127,875 € in the third year, 10,490,750 € in the fourth year, and 13,970,750 € in the fifth year of Lean Six Sigma deployment. This is simply the total annual cost that the organization has to bear for the deploying and sustaining the Lean Six Sigma initiative. The Yearly Total Cost is the sum of the Launch and Development Costs, Personnel Costs, and any other costs that the organization might have to accommodate due for Lean Six Sigma deployment. The estimated yearly total costs are 1,625,600 € in the first year, 4,293,650 € in the second year, 7,452,925 € in the third year, 10,705,625 € in the fourth year, and 14,190,200 € in the fifth year of Lean Six Sigma deployment. This is the revenue that is generated through (or as a result of) the DMAIC projects that are part of the Lean Six Sigma initiative. To calculate this KPI, you should take an estimated average net income for the DMAIC projects and then multiply it by the number of projects that you expect to complete within the year. You should be looking towards a yearly project net income are 5,000,000 € in the first year, 18,562,500 € in the second year, 36,800,000 € in the third year, 51,187,500 € in the fourth year, and 59,400,000 € in the fifth year of Lean Six Sigma deployment. This is the profit that is generated through the implementation of Lean Six Sigma in an organization and can be calculated simply by subtracting the Yearly Total Costs from the Yearly Project Net Income. For measuring the ROI of the Lean Six Sigma initiative adequately, we recommend that you measure it in the form of two KPIs: Yearly ROI and Cumulative ROI. The goal should be to achieve a Yearly ROI of 3,374,400 € in the first year, 14,268,850 € in the second year, 29,347,075 € in the third year, 40,481,875 € in the fourth year, and 45,209,800 € in the fifth year of Lean Six Sigma deployment. The Cumulative ROI is simply the running sum of the Yearly ROI that shows the total profits that have been generated through the Lean Six Sigma initiative. Ideally, this should be above the 100,000,000 € mark after five years of Lean Six Sigma deployment. The total number of belt i.e. Master Black Belts, Black Belts, and Green Belts that are part of a Lean Six Sigma initiative is another important KPI to measure. It is essential that you keep track of the number of the number of belts since these directly correspond to the number of DMAIC projects that an organization can complete. Black Belts: 8 by the first year, 17 by the second year, 27 by the third year, 38 by the fourth year, and 50 by the fifth year of Lean Six Sigma deployment. Master Black Belts: 2 by the second year, 3 by the third year, 5 by the fourth year, and 6 by the fifth year of Lean Six Sigma deployment. Green Belts: 40 by the second year, 108 by the third year, 152 by the fourth year, and 200 by the fifth year of Lean Six Sigma deployment. DMAIC projects are the primary source of revenue generation in the Lean Six Sigma strategy and therefore, you should always look to maximize the number of successful DMAIC projects. However, be careful not to be hasty since you need the right personnel and tools for ensuring the success of these projects. The general rule of thumb is that the number of DMAIC projects should be at least two and a half (2.5) times the number of Black Belts in an organization. Therefore, a rough estimate of how many DMAIC projects do you need can be calculated by multiplying the BBs with 2.5. You should be looking forward to (successfully) completing 20 projects in the first year, 83 projects in the second year, 184 projects in the third year, 293 projects in the fourth year, and 396 projects in the fifth year. The cumulative should be 975 DMAIC projects within a five-year tenure. Now that you are aware of the KPIs that you need for measuring the success of your Lean Six Sigma transformation, let us discuss how you should go about the evaluation process. Each KPI that we have mentioned above should be measured and recorded annually and at the start of the business year, you should compare it against the estimates that we have provided you with (scaling them up or down depending on the size of your company). A good approach is to make use of statistical tools such as frequency curves and histograms for summarizing the information in a single graphical representation. This will allow you to monitor growth and analyze the progress of the transformation in a better way. If one or more of the KPIs is below par, then you should retrace your steps and consult your experts again to determine if you have missed out on anything in the transformation plan. You should hold a meeting with the Lean Six Sigma Champion (or Leader) and the Program Manager to determine the root cause of concern and eliminate it to achieve the desired results. The Key Performance Indicators for tracking your Lean Six Sigma transformation are: Launch and Development Costs, Personnel Costs, Yearly Total Costs, Yearly Project Net Income, Return On Investment (ROI), Number of Belts, Number of DMAIC Projects. The number of belts directly correspond to the number of DMAIC projects that an organization can successfully complete. Each KPI should be measured annually and represented through appropriate statistical tools for evaluating the performance of the Lean Six Sigma initiative. If results are not as desired, it is best practice to conduct a meeting with the LSS Leader and Program Manager to eliminate roadblocks and errors with the transformation program. If you enjoyed this post, we would be very grateful if you’d help it spread by emailing it to a friend, or sharing it on Twitter or Facebook.